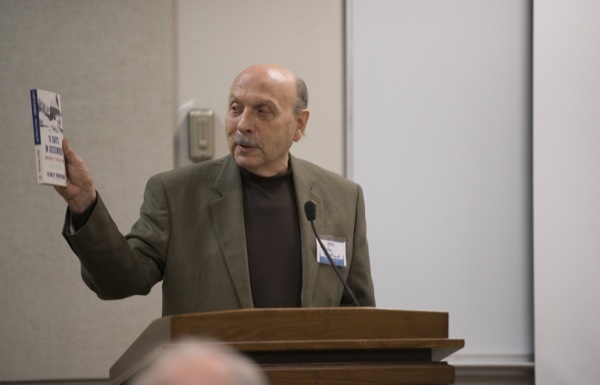 Author Stanley Weintraub discussed his book about the World War I Christmas truce during a meeting of the University of Delaware Association of Retired Faculty. 3:26 p.m., Dec. 10, 2012--An unbelievable thing happened during the first holiday season of World War I  peace broke out. How the killing stopped for a few days in northern France and Flanders was the topic of a talk given by Stanley Weintraub, the author of Silent Night: The Story of the World War I Christmas Truce (Free Press 2002), during a University of Delaware Association of Retired Faculty luncheon held Tuesday, Dec. 4, in Clayton Hall. Weintraub, the Evan Pugh Professor Emeritus of Arts and Humanities at Penn State University, has written numerous histories and biographies, including Long Day’s Journey Into War: Pearl Harbor and a World at War-December 7, 1941 (Dutton Adult, 1991). A while later, Weintraub was put in touch with a British Broadcasting Company producer who had done a radio series with veterans of World War I.
Weintraub and his wife Rodelle, author of Fabian Feminist: Bernard Shaw and Woman (Pennsylvania University Press, 1977) spent the next several summers at the British Library newspaper archive at Colindale and the Imperial War Museum, both in London, perusing letters to the editor and records of the British Army companies who were at the front during that long ago Christmas. While individual military members have never had the power to stop a war, some of the combatants facing each other across that no man’s land between 300 miles of trenches decided to celebrate Christmas as best they could. German soldiers, closer to home than the British forces, had traditional tabletop Christmas trees trucked to the front, placing the candle-trimmed holiday icons atop the parapets above the trenches, Weintraub said. Another popular topic for discussion was the idea of a football (soccer) match, a seemingly impossible goal as the deadly piece of real estate was filled with shell holes and the bodies of the dead and wounded. The idea persisted and the wounded were removed and clergy from both forces presided over mass burials for fallen soldiers. The combatants also decided to exchange holiday gifts. There was also a spirited Christmas carol competition with a German tenor from the Berlin Opera singing Silent Night. The French countered with a Paris Opera tenor performing Cantique de Noël (O Holy Night). Weintraub said the British soldiers were so floored by what happened  no shooting, and quiet, almost like the war had ended  that they sent letters to their parents, wives or girlfriends, who in turn sent these to the English newspapers as letters to the editors. Of course, the truce couldn’t last. Soldiers from the front were pulled and troops from the reserve rear areas that had not participated in the Christmas truce were moved to the front. While no definitive list of casualties can be cited, the number of combatants killed in the World War I is estimated to be between 7-10 million. Called the “war to end all wars” by then U.S. President Woodrow Wilson, the conflict also took the lives of 7 million civilians. As for the soccer matches, the Germans won most of them.